Fall is upon us and we know we are not far from winter. Nothing is worse than being cold so now is the time to start thinking about bundling up. Layering clothes is a great way to keep warmer while still maintaining that sense of fashion. You can also be fashionable while not going broke with Shopbop. From Diane von Furstenberg jackets to Yigal Azrouel coats to Rebecca Taylor jackets, there are many choices to choose from. Shopbop has your top designers that range from clothing, shoes, bags to accessories in all one easy to shop for format. What I like is the search options from Shopbop from choosing my favorite designers to what is new to the specific category and the Lookbooks are great ways to find the look you want. If you want more ideas, check out the Shopbop Pinterest boards. 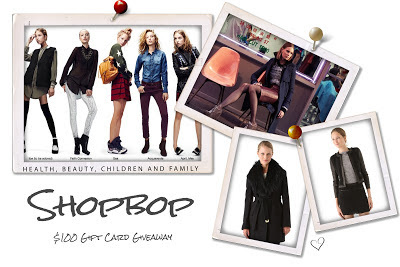 One winner will receive a $100 gift certificate to shop at Shopbop! I would love the Frye Veronica short boots! Thanks for the chance to win! I would get a Rag and Bone Faren Dress! I would love to get the Maison Scotch Shiny Fashion Shopper bag! I'd love the Rebecca Taylor strapless gown. i would pick a pair of marc jacobs mouse flats! thank you so much! Crystal Strand Necklace and the Chan Luu Friendship Bracelet. love the Tory Burch Robinson Middy Satchel! I'd like to get the white Sorel Tofino waterproof boots. I like the Jeffrey Campbell Cline heels! I'd pick Club Monaco's Jackie sweater! I would love to get the Boutique 9 Zanny Knee High Boots. I adore Superga Cotu Classic Sneakers / UNIF Hellraiser Flats! I'd pick a Rebecca Minkoff bag!! I'd get the Citrine by the Stones ring! i think buy some dresses!!! Corduroy Leggings in boppin blue! Fingers crossed! I'd love to win a GC! Packables Backpack - Marc by Marc Jacobs. I'd put it towards getting this: Maison Scotch Shiny Fashion Shopper. Love it! I would use it towards a Christopher Kon Lady Woven Wallet. I'd get the Low Luv x Erin Wasson Cosmos Double Finger Ring. I would get the Marc by Marc Jacobs Dreamy Logo Neoprene E-Reader Book. I ♥ Pencey Sequin Top with Short Sleeves with jeans and the Matt Bernson Jardin Glitter Booties it's a great look!!! I really like this dress! I would get Salvatore Ferragamo My Belle Lace Flats. So pretty! Jefferey Campbell boots in suede for my wife. Thank You! I'd pick the studded shoulder bag! Rag and Bone Faren Dress! a dress for New Years!!! free people cardigan dress & a nation ltd montlake dress or a feel the piece v-neck maxi dress! I would get the feel the piece pump jumpsuit! I like the Marc Jacobs Too Hot to Handle Hobo Bag. I would chose the Marc Jacobs Sweater Scarf. I NEED a Michael Kors Rose Gold Watch!!! I would pick the Marc by Marc Jacobs Pedal to the Metal Natasha bag in Darkest Teal! So cute! Thanks for the great giveaway! I like the Anya dress. current/elliott boyfriend jeans in superloved.